Kevin Young is the Director of the Schomburg Center for Research in Black Culture, newly named a National Historic Landmark. He is the author of twelve books of poetry and prose, most recently Blue Laws: Selected & Uncollected Poems 1995-2015 (Knopf, 2016), longlisted for the National Book Award; Book of Hours (Knopf, 2014), a finalist for the Kingsley Tufts Poetry Award and winner of the Lenore Marshall Prize for Poetry from the Academy of American Poets; Ardency: A Chronicle of the Amistad Rebels (Knopf, 2011), winner of an American Book Award; and Dear Darkness (Knopf, 2008). His collection Jelly Roll: a blues (Knopf, 2003) was a finalist for both the National Book Award and the Los Angeles Times Book Prize. Young’s nonfiction book, Bunk: The Rise of Hoaxes, Humbug, Plagiarists, Phonies, Post-Facts, and Fake News (Graywolf Press, November 14, 2017), is a finalist for the National Book Critics Circle Award and the PEN/Jean Stein Book Award, was longlisted for the National Book Award, and named a New York Times Notable Book, a New York Times Book Review “Editors’ Choice” selection, and a “Best Book of 2017” by NPR, the Los Angeles Times, Dallas Morning News, Atlanta Journal-Constitution, Smithsonian, Vogue, the Atlantic, Nylon,BuzzFeed, and Electric Literature. Young’s previous nonfiction book, The Grey Album: On the Blackness of Blackness (Graywolf Press, 2012), won the Graywolf Press Nonfiction Prize and the PEN Open Book Award; it was also a New York Times Notable Book for 2012 and a finalist for the 2013 National Book Critics Circle Award for criticism. He is the editor of eight other collections, most recently The Collected Poems of Lucille Clifton, 1965-2010 (BOA Editions, 2012) and The Hungry Ear: Poems of Food and Drink (Bloomsbury, 2012). Named University Distinguished Professor at Emory University, Young was inducted into the American Academy of Arts and Sciences in 2016. 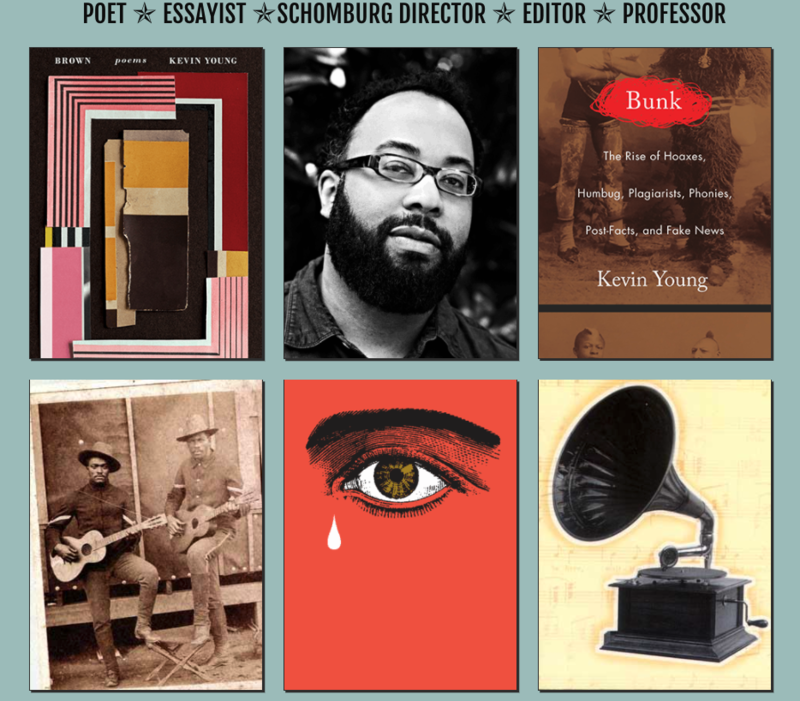 Kevin Young has been serving as Poetry Editor of the New Yorker starting in November 2017.